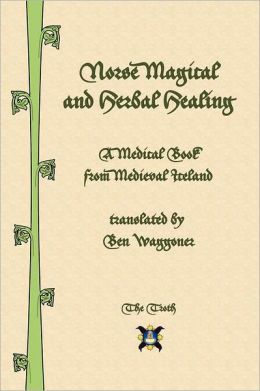 Norse Magical and Herbal Healing: A Medical Book from Medieval Iceland, translated and edited by Ben Waggoner, is a new translation of the text known as AM 434a, which was written around the year 1500. It also contains an academic paper by Waggoner worked into the introduction, and bonus material in the appendices and indices. The introduction starts by describing the manuscript he translated. Then it goes into the prehistory of European healing traditions, including evidence for plant use based on archeology and linguistics. Waggoner goes through the history of medicine from the beginnings of Indo-European history from the Stone Age through the Bronze Age, the Roman Empire, the early Christian era, and finally medieval times. He details the culture and context of medieval medicine in northern Europe, and medical manuscripts written in Norse and Germanic languages. The text of the translated manuscript is only thirty-two pages long, but it gives tons of remedies, including both recipes for cures and magical prescriptions such as saying specific prayers. Christian prayers such as the pater noster mix with magical formulae that bear obvious heathen origins. Some of the animal based cures are truly horrifying for a modern reader. Scientific research aside, the cures in this book are not recommended for actually treating any medical conditions in the modern age. Many of the cures seem to rely more on magic and prayers than on the natural properties of herbs. Still, it may be useful to the serious student of European magic. Unfortunately the author was unable to access the original document, but had to rely on previously published works. The two appendices are the Table of Plant Species, which presents common and Latin names for various herbs, and Icelandic Folklore, which presents magical charms, including symbols such as the Helm of Awe, plant lore, and spells. From the number of different spells dealing with thievery, there must have been a huge problem with that in medieval Iceland. Those looking for spells one might actually want to cast may be disappointed to discover how many of the spells and cures in the book demonstrate a callous disregard for the lives of animals. One of the thief-related spells includes calling a dog and the dog dying while running obediently to its master, the spell caster. The book concludes with a bibliography, end notes, and an index to plant names. I recommend this book for the advanced student of the history of magic, medicine, and folklore, and for those interested in reconstruction of heathen ways from Christian-era manuscripts. It is not a spellbook for use by the modern practitioner of magic, nor a book of herbal medicine for modern use. With quotes in multiple languages and end notes longer than the actual medieval manuscript itself, this is not a book for beginners. I recommend it for the college level reader.